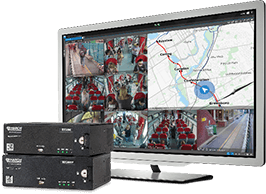 BERLIN, GERMANY –– March Networks®, a global provider of intelligent video solutions, today introduced its leading transit video recording and management offering to the European passenger rail and bus fleet markets. The end-to-end solution helps transit agencies improve security and incident investigation using integrated high-definition (HD) surveillance video coupled with advanced vehicle metadata searching. It dramatically reduces the time required to prepare and defend cases, and is currently deployed in more than 33,000 trains, subways and buses, as well as hundreds of wayside locations, across North America. The solution starts with purpose-built March Networks RideSafe™ RT Series IP Recorders for passenger rail cars, and RideSafe MT Series IP Recorders for buses. The RideSafe RT Series recorders are available in two 20-channel models, including one with eight Power over Ethernet (PoE) ports for rail cars requiring integrated camera power. The compact RideSafe MT Series recorders for buses include 4, 6 and 8-channel models and support PoE. All of the recorders capture sharp megapixel video at a full 25/30 fps per channel, and support automated video downloading over WiFi, GSM, LTE, 4G and 5G wireless networks to save operators time and keep vehicles in service longer. Continuing March Networks’ commitment to video solutions that enable better operational intelligence and risk mitigation, the RideSafe recording platform delivers innovative search and investigation capabilities through integration with leading vehicle systems including: Global Positioning Systems (GPS); Train Control and Management Systems (TCMS); Passenger Information Systems (PIS); Computer Aided Dispatch (CAD); and Automated Vehicle Location (AVL). Virtually any video and data evidence captured by the March Networks system can be a selection point for investigation. The integrated video and data enables operators to search for recorded events such as emergency brake activation, speed, location and driver-tagged incidents, and review these incidents along with the associated video. It allows transit operators to investigate complaints, liability claims and other events quickly and cost-effectively, and resolve disputes with the help of compelling video evidence. Operators can also use the investigation tool to proactively identify and address potential issues, such as a malfunctioning door, before an incident occurs. In addition, the RideSafe video platform is engineered for reliable operation in demanding transit environments, incorporating features such as an embedded Linux OS, solid state drives, front panel diagnostic LEDs, and real-time system health monitoring. It is also compliant with multiple environmental, electromagnetic (EMC), shock/vibration and fire safety regulatory standards, including EN50155, E-Mark, CE and EN45545. March Networks will showcase its intelligent video solution for transit in Hall 7.1a / 210 at InnoTrans 2018, September 18-21 in Berlin, Germany. To learn more, please visit marchnetworks.com/innotrans-2018. March Networks, March Networks RideSafe, March Networks Command and the March Networks logo are trademarks of March Networks Corporation. Infinova is a trademark of Infinova Corporation. All other trademarks are the property of their respective owners.